I’m not happy that every phone call I make — and every phone call that gets made to me — is being logged and reviewed by my government. I’m not happy that the Patriot Act, passed into law in a time of great crisis, has resulted in my sacrificing so many of my constitutionally guaranteed freedoms. 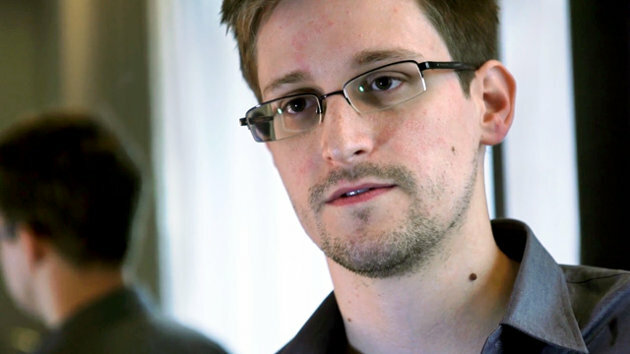 I’m also not happy that a high school dropout named Edward Snowden (above) who hasn’t reached the age of 30 and is working for a government contractor is in a position to know so much about so many people, and to reveal so many secrets about American data mining to the media. I’m also trying to decide whether he is Daniel Ellsberg or Benedict Arnold. But I know this much: I was in New York on 9/11, and I remember the sound of the fighter jets flying overhead, and the look of terror on the people in the streets. And I remember walking from work to Grand Central Terminal a couple of days later, and seeing a million people in the street, because the terminal and the skyscraper above it were evacuated due to a bomb scare. And I remember the firetruck screaming down Madison Avenue, and the tears that came to my eyes when I saw all the people breaking into cheers for the heroes on the truck. And I never want to see or experience anything like that again. Once a lifetime is enough for me, thank you. So it’s difficult to weigh my demand for privacy against my desire to be kept safe from maniacs who want me dead due to the circumstances of my birth and nationality. Yes, I worry about potential government abuse of privacy from a program designed to prevent another 9/11 — abuse that, so far, does not appear to have happened. But I worry even more about another 9/11. That is, I worry about something that’s already happened once — that was staggeringly costly — and that terrorists aspire to repeat. I worry about that even more, not because I don’t care about civil liberties, but because what I cherish most about America is our open society, and I believe that if there is one more 9/11 — or worse, an attack involving nuclear material — it could lead to the end of the open society as we know it. If there were another 9/11, I fear that 99 percent of Americans would tell their members of Congress: “Do whatever you need to do to, privacy be damned, just make sure this does not happen again.” That is what I fear most. That is why I’ll reluctantly, very reluctantly, trade off the government using data mining to look for suspicious patterns in phone numbers called and e-mail addresses — and then have to go to a judge to get a warrant to actually look at the content under guidelines set by Congress — to prevent a day where, out of fear, we give government a license to look at anyone, any e-mail, any phone call, anywhere, anytime. That pretty much sums it up for me. If it comes down to siding with the NSA or Al Qaeda, I’m going with the NSA. Pick your poison. This entry was posted in In the News, Politics and tagged data mining, Edward Snowden, NSA, Patriot Act, Thomas Friedman by stephenbromberg. Bookmark the permalink.